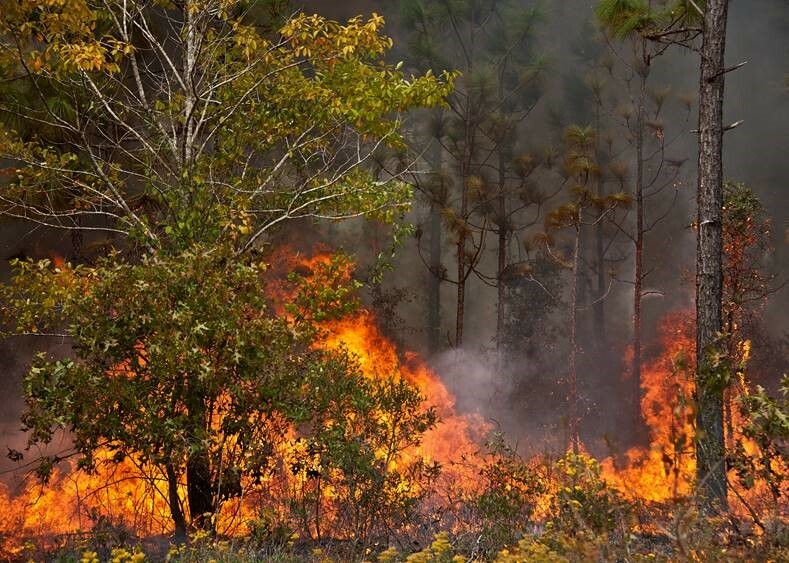 Another installment in a series about how VCOM is used for aerospace communications applications. NEEMO (NASA Extreme Environment Mission Operations project) sends groups of astronauts, engineers and scientists to live in Aquarius, the world’s only undersea research station, for up to three weeks at a time. 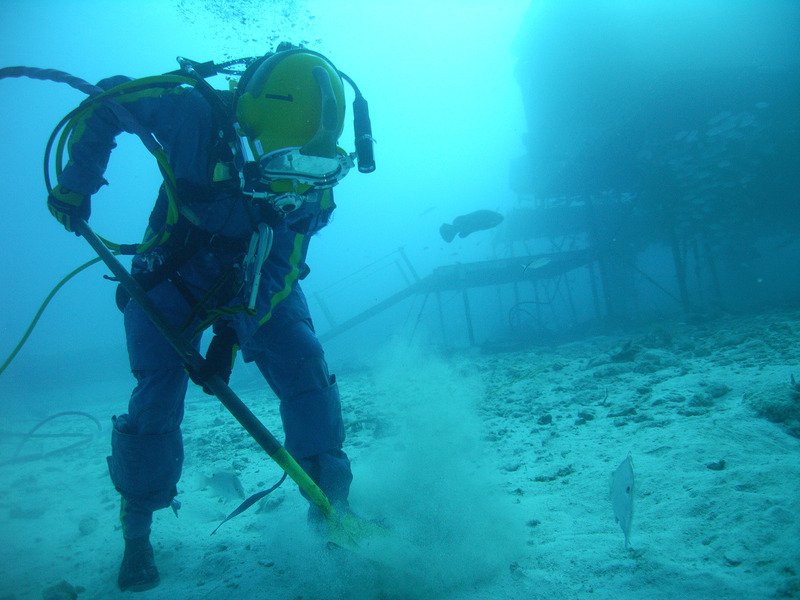 Aquarius is operated by Florida International University (FIU) and located 3.5 miles off Key Largo in the Florida Keys National Marine Sanctuary where it is deployed next to deep coral reefs 62 feet below the surface. 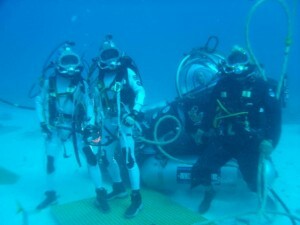 During NEEMO missions the aquanauts are able to simulate living on a spacecraft and test spacewalk techniques for future space missions. The July 2015 mission will test time delays in communications using VCOM to simulate delays due to the distance of potential mission destinations. Communications Systems or “Matrix Intercoms” used in the Broadcast Television industry have traditionally been hardware-centric. These systems rely on signal specific circuit cards, circuit card frames and frame interconnection methods. 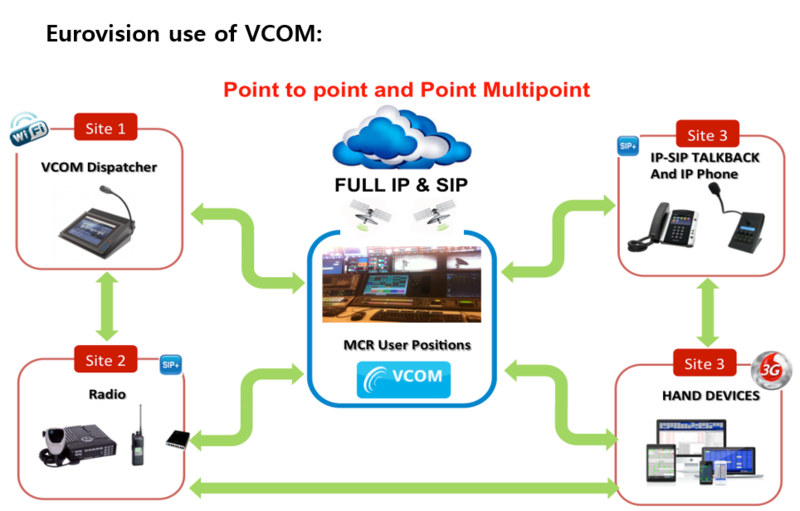 Now broadcasters are able to bring their communication and intercom systems into the future with the VCOM Virtual Communications platform. VCOM eliminates the need for frames, circuit cards and scales to thousands of users while supporting virtually an unlimited number of point-to-points, group calls, and Party Lines (“PLs” for conference channels). 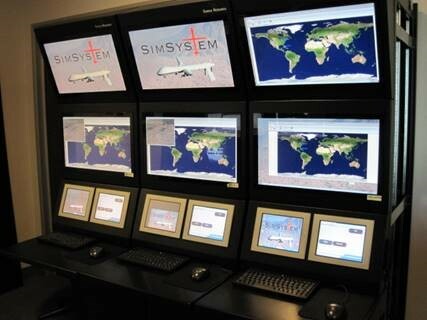 VCOM is software based, completely virtual, fully configurable and redundant capable. The System can run on anything from the smallest notebook PC to the largest of professional business class servers. Moreover, IntraCom’s own selection of hardware Touchpanels is complemented by the largest selection of compatible user interfaces of any communications system on the market. With VCOM Cloud Services, for the first time ever, traditional communications systems can be replaced or augmented with cloud based communication infrastructure. 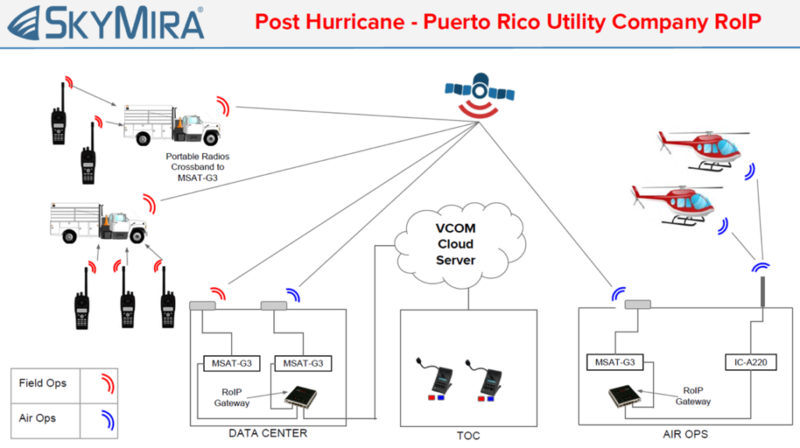 Use the VCOM Cloud as a stand-alone system without having to provide your own communication systems infrastructure, or interface communications from disparate locations thru the VCOM Cloud to a local VCOM or traditional communication systems. The VCOM Software GUI runs on any Windows, Mac, iOS or Android device, breaking wide open the possibilities of providing user interfaces catered to any broadcast client. VCOM’s compact matrix profile and user interface possibilities just begin to describe the striking differences between VCOM and traditional broadcast communications systems. 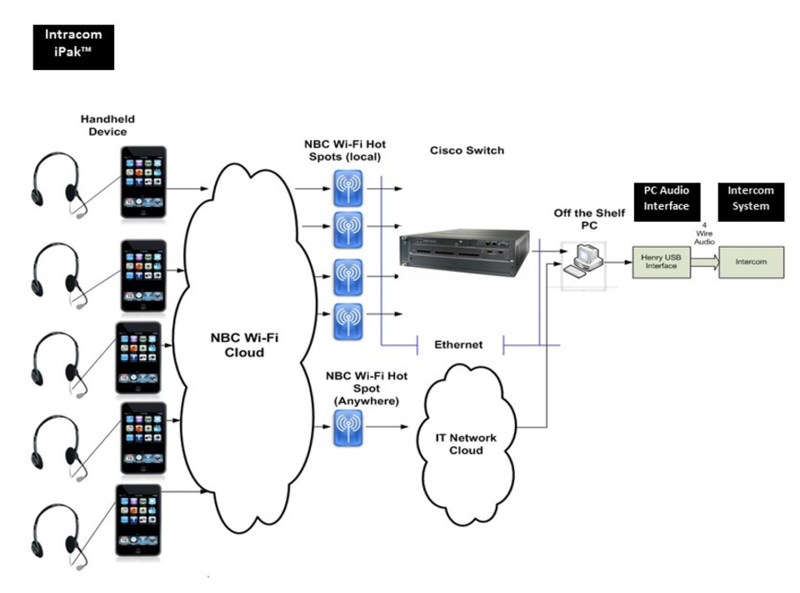 VCOM is also compatible, and in some cases intelligently interoperable, with existing hardware based systems. 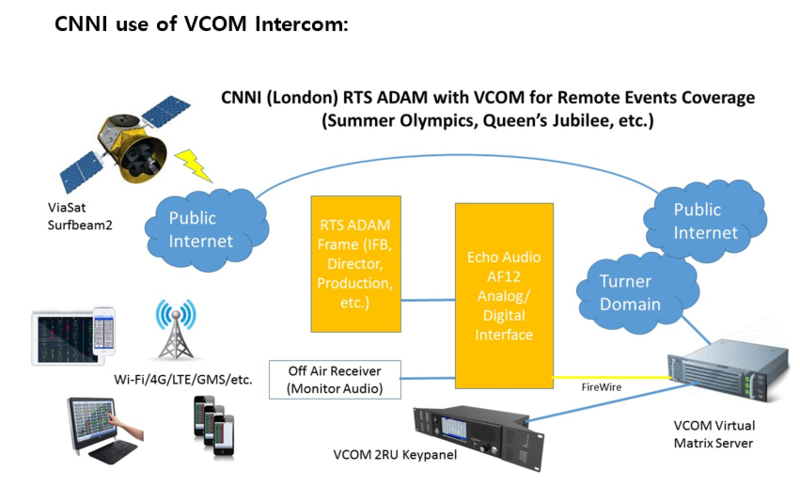 This allows Broadcasters to install both new, stand-alone VCOM Systems, or add VCOM to their existing intercom systems to “bridge” current and future user interfaces and signal transports. 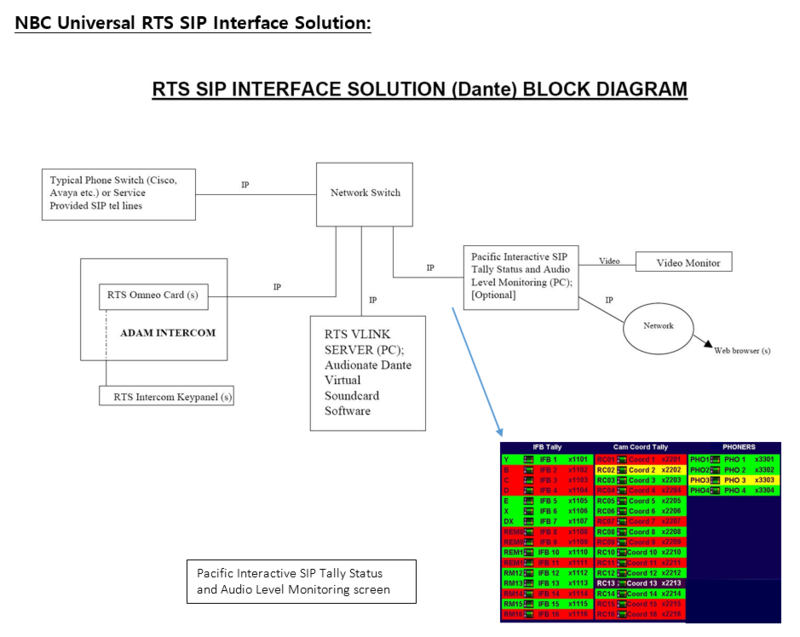 Using VCOM’s integrated SIP server and / or device interface software, customers can readily connect SIP, MADI, DANTE, VOIP, ROIP, analog, two-wire, four-wire, and traditional wireless systems. VCOM can also bring access to two-way radio systems to VCOM platform users, saving cost for radios, maintenance and repeaters and can also patch radios together into talk groups. The advent of the VCOM Virtual Communications and intercom platform has already opened the eyes and minds of many major broadcasters, and the applicability of this unique system to any new or existing communications environment literally creates new ways of doing business every day. SmartMic conference talk-back systems for use in studio audience talk shows. The broadcasting operational world is mostly based on communicating. For that reason, EBU has always distinguished itself from the competition by choosing a system of communication dedicated solely for their member stations; namely an EMEA consortium of 175 broadcasters coordinating all satellite newsfeed uploads (and DSNG feeds) from every world capital city and any remote news, sports and entertainment events to their Geneva NOC/MCR operations. External audio connections via VCOM Device Interface to legacy intercoms, two-way radios, etc.). 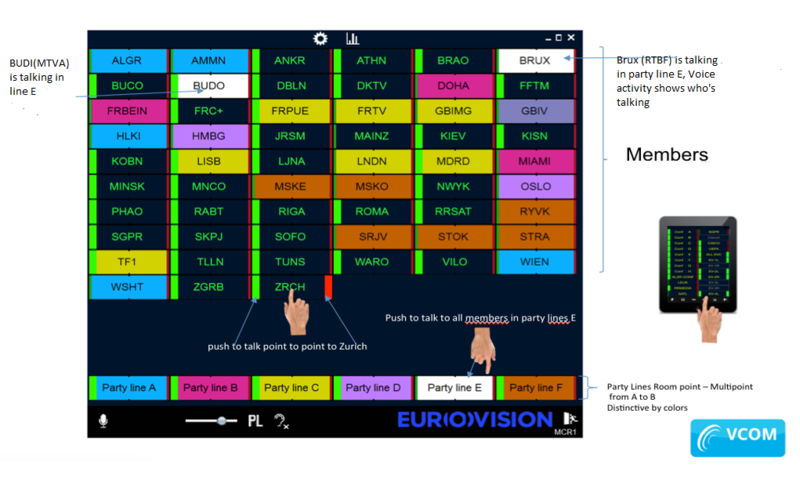 Member stations can instantly open talk paths to NOC/MCR via party lines and/or point-to-point connections and also have 10 private conference lines for discussions that do not require NCO/MCR participation. The number of individual users and party lines is virtually unlimited. For satellite uplink control and coordination, they use VCOM “PL Assignment Mode” to dynamically assign remote SIP-based terminal devices to a bank of 8 human coordinators to balance their respective workload on the fly. 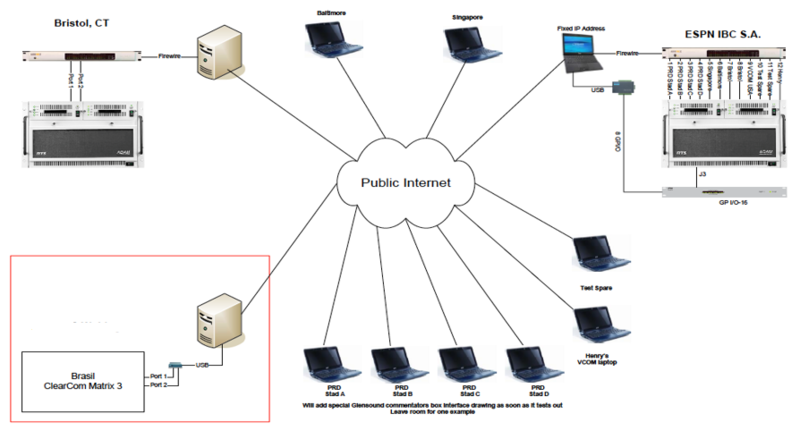 PL Assignment function is also used for very rapid, two-way radio interconnect (“patching”) between any radio users anywhere in the world to other radios and all can be made accessible to any users, groups, smart devices, computers and external systems (VoIP, PSTN, etc.). Today VCOM is used in all majors EBU events coverage (Champions League, Europa League, NBA, elections, World Cup, Olympic Events, Formula 1, GP Moto, Cycling) and news gathering. 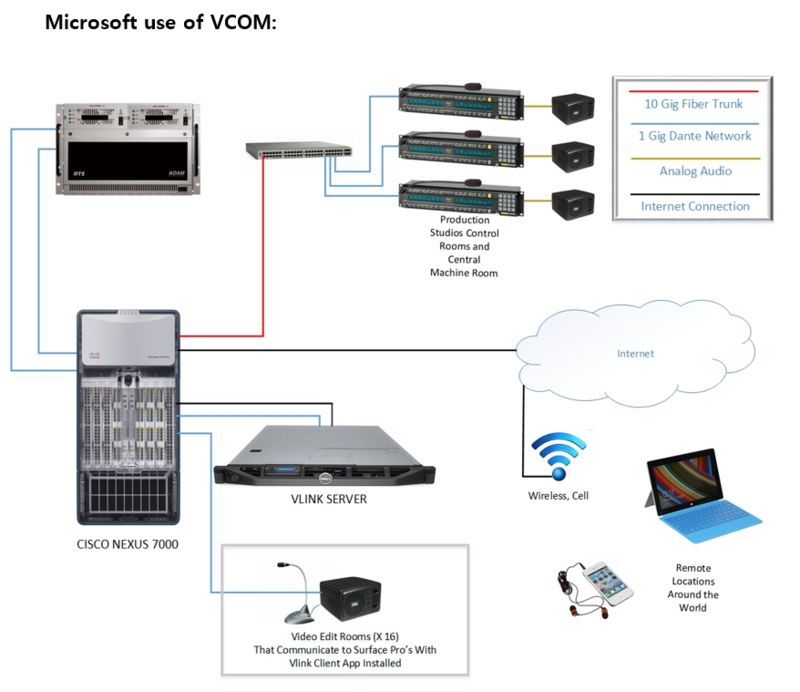 They recently used VCOM at the Davos World Economic Forum to connect two-way radios, mobile smart phones/tablets and PSTN lines together, including some Skype users, and also connected local IFB into one cohesive matrix intercom with full control of interoperability. For remote coverage, personnel can hand-carry portable SIP devices to a job site, connect to any available Ethernet to automatically log in to NOC/MCR for a true plug-and-play deployment. Turner Broadcasting & Turner Studios: Using VCOM for connecting Telex matrix intercom frames between New York City, Atlanta and other sites with added IP access and for remote operations at sporting events, such as between NBA-TV, Turner, and CBS Sports; using VLINK (RTS Telex version of VCOM with RTS proprietary, intelligent-trunked connections) and expanding their existing VCOM systems to include remote broadcast trucks and adding SIP telephone connections. iTV Sport (London): used VCOM for 2014 World Cup coverage, similar BBC News and CNNI. ESPN: Multiple World Cup games coverage; also used for X Games (extreme sports), and other sports events, transmission communications and broadcast coordination, depicted below. SABC used VCOM for interconnecting intercom systems for 2010 World Cup from several different manufacturers (Prospect Electronics, Bosch/RTS/Telex, ClearCom, and Riedel) at seven different sites in-country, including IBC, SCC, MCR, and four remote venues, while adding additional remote connectivity to those existing systems. They have since increased their VCOM system size for remote coverage of extraordinary events, such as municipal and national elections, overseas news coverage, etc., and also in remote broadcast trucks. 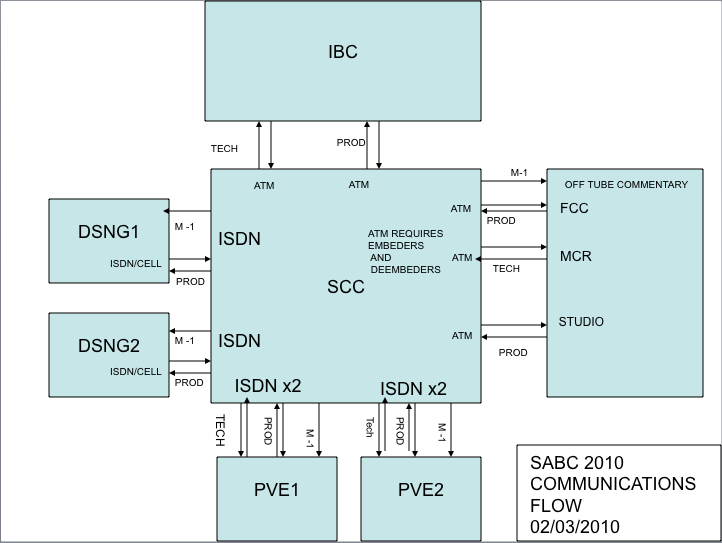 On the next page is a drawing of how SABC interconnected the respective matrices into a cohesive system. SCC was at Convention Center running Riedel matrix frame; MCR used ClearCom & Drake; IBC was Host Broadcaster build out that used ClearCom and/or Prospect; DSNG1 and DSNG2 used 3G/cellular for fixed mobile operation; PVE1 and PVE2 used ClearCom Eclipse matrix. Aquavision / National Geographic WILD: Live broadcast at night to observe if Great White Sharks would attack humans swimming. Produced from diving boat platform located at reef 6 km offshore (Aliwal Shoal, South Africa), underwater IFB, on-boat coord, on-shore (local MCR) and US MCR using Wi-Fi/wired/satellite links. TV2 (Denmark): 50 remote journalists worldwide connect to ClearCom frames at MCR in Copenhagen via VCOM using laptops, iOS and Android devices from live events anywhere in the world. CBS Sports: private VPN to Broadcast Center for coord and remote access from broadcast trucks at events, also for auxiliary cameras comms for major events, i.e., NCAA March Madness coverage.